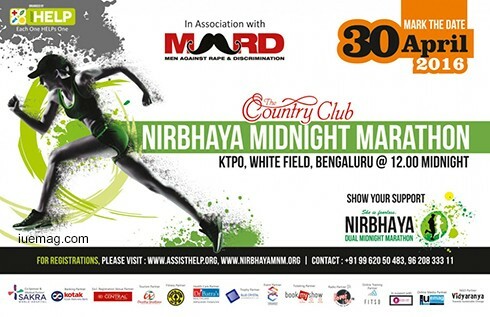 As a tribute to the India’s Women, Bangalore hosts its first of its kind marathon titled Assist HELP’s NIRBHAYA MIDNIGHT MARATHON on 30th April 2016 which is expected to witness participants from India and abroad across all age groups of Bangalore. The event is expected to graced by the presence of Honorable Minister for Chemicals and Fertilizers, Govt of India, Shri Ananth Kumar, Ms. Arundhati Nag, and Bengaluru’s fitness queen Wanitha Ashok. However, the star attraction of the event will be participants from NGOs who were challenged in society and living in a fighting spirit. Under best in class security and event arrangements Nirbhaya Midnight Marathon will see enthusiasts from across India to participate and in support of a cause. The first run will be flagged off from KTPO, whitefield in four different groups. The longest stretch covered in this marathon will be the to and fro journey from KTPO, Whitefield, which covers the distance of 42 Km. The event is organized by an NGO-Assist HELP Foundation and Sponsored by Country Club pvt Limited, Sakra World Hospital and Kotak Mahindra Bank, India. Assist HELP Foundation has been working actively towards the cause of community welfare by taking up projects dealing with poverty eradication, providing education and several other issues. The Marathon will be conducted in four groups that included Group A running for 5 Km, Group B for 10 Km, Group C for 21Km and Group D for 42Km. Every participant will be given a special certificate of appreciation. 10 k, 21 k and 42 k groups are timed run and all the participants will be informed around their actual timing of completion. The organizers also arranged for gifts to participants, along with free refreshment and health drink for all participants. About AssistHELP Foundation: AssistHELP is an organization with a primary objective to serve underprivileged human beings by the capable others. AssistHELP works with a simple and focused formula - ‘each one to help one’. Currently their projects are operational across the four broad areas which includes all the basic necessities of society and where assistance with in the society is a need. These areas are Health, Environment, Literacy and Poverty. Any facts, figures or references stated here are made by the author & don't reflect the endorsement of iU at all times unless otherwise drafted by official staff at iU. This article was first published here on 26th April 2016.